It’s absolutely terrible to be a chicken in America. Chickens are not given the same federal protections as other food animals because they are exempt from the Humane Methods of Slaughter Act, which dictates how our food animals are killed. This is shocking, especially in light of the fact that chickens make up over 90% of animals killed for food. With beef prices at the highest they have been in 27 years, consumers are choosing poultry — and are actively encouraged to do so — to save money: In Delmarva, a difference of $4.00 was found between beef and chicken costs. A chicken farmer told WBOC 16 that “the trend means job security for all those who work in the industry.” But what about the chickens? This trend surely means more chickens will suffer and be killed for food. But does anyone care? In recent days, I’ve been quite upset at the way people portray, ridicule, and demean chickens. I had to defend the intelligence of chickens on a website, and then I came across a new product that just disgusted me. 1. Stop Perpetuating the Myth that Chickens are stupid! Chickens are not mere automata; instead they have been shown to possess sophisticated cognitive abilities. Their communication is not simply reflexive, but is responsive to relevant social and environmental factors. Chickens demonstrate an awareness of themselves as separate from others; can recognize particular individuals and appreciate their standing with respect to those individuals; and show an awareness of the attentional states of their fellow fowl. Further, chickens have been shown to engage in reasoning through performing abstract and social transitive inferences. This growing body of scientific data could inform a rethinking about the treatment of these animals. Comparing members of the same species might be useful in terms of the ways in which individuals learn social skills or the speed of learning different task, but comparing dogs to cats or dogs to pigs says little of importance. Another reason why these cross-species comparisons are relatively meaningless and get us on a slippery slope is because some people claim that supposedly smarter animals suffer more than supposedly dumber animals and that it’s okay to use the dumber individuals in all sorts of invasive and abusive ways. There are absolutely no sound scientific reasons to make this claim. 2. Stop Romanticizing Dead Birds! Dead flesh is romantic now? That we think it’s okay to mock and deride chickens allows us to be comfortable with exploiting them. This ridiculous attempt at romance highlights this. 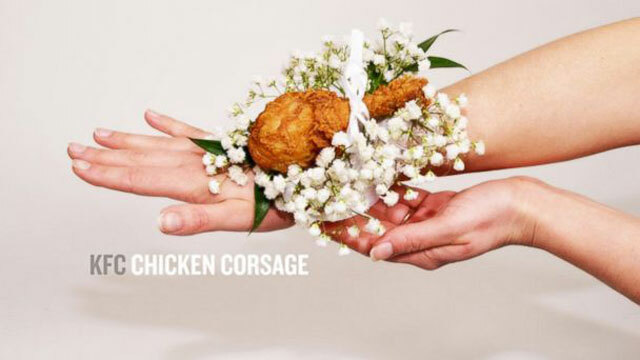 Werner Herzog’s favorite place to eat chicken flesh, aka KFC, recently unveiled their fried chicken corsage, just in time for prom season. Publicity stunts like this are attempts at distancing ourselves even further from the violence that was committed on the chickens to make the product. The absurdity of having a chicken corsage allows people to laugh and forget about the animals who suffered. But the eating of animals — and in this case, chickens — is not funny. Here’s a reminder of the cruelty that commonly takes place at the places where your food is raised and killed. And here’s another. So the next time you come across an article urging you to choose poultry instead of beef, please reconsider. Plenty of cruelty-free, nutritious and delicious options exist, such as lentils, beans, or tofu. You’ll save money and won’t be contributing to the torture and murder of sentient beings.